This fly has lots of enticing movement with its long rubber leg tail. This rubber leg tail is unique in that it has plastic sleeve holders that prevent the legs from getting caught/tangled under the hook when casting. 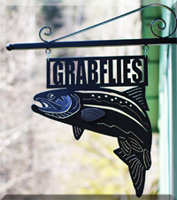 Steelhead have a definite soft spot for stone flies. What makes the Stone flies so unique? Unlike other aquatic insects, which are available to the fish for a short period of time, Stone Flies are available to the fish all year. This fly has lots of enticing movement with its long rubber leg tail. This rubber leg tail is unique it that it has plastic sleeve holders that prevent the legs from getting caught/tangled under the hook when casting. Steelhead have a definite soft spot for stone flies. What makes the Stoneflies so unique? Unlike other aquatic insects, which are available to the fish for a short period of time, Stone Flies are available to the fish all year.